I have been known to use the "skating into the puck" metaphor to explain a particular leadership competency in my role as principal. The more I reflect upon it, the more significant and profound it becomes. 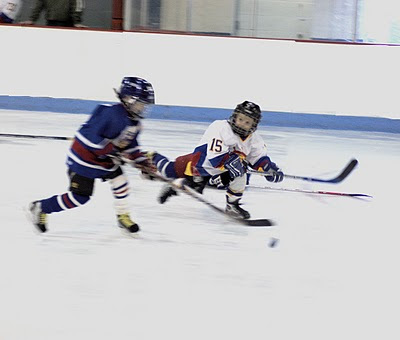 In hockey, “skating into the puck” usually signifies going to the “tough” part of ice (after all , no one is going to easily “give up the puck”). In my role as principal, this may involve having a difficult conversation or making a difficult decision (usually the conversation that others don’t want to have, decisions others don’t want to make or taking actions others might shy away from). In hockey, engaging with someone without the puck is an interference penalty. Likewise in my job, I can’t “skate into the puck” in all situations. At times, various stakeholders come to me demanding that I intervene in a given situation. Depending on circumstance and/or participant, it may not be prudent or proper to get involved. Sometimes professional ethics and/or protocols demand that someone else “skate into the puck”. Skating into the puck does not mean “taking a roughing penalty”. My interactions need to be respectful and empathetic in nature and based on the true spirit of collegiality. Communication rooted in honesty is a non-negotiable. While we may not always agree, we must always respectfully disagree. If you’re a skater in hockey, your job is to possess the puck. There are times when my job demands that I "skate into the puck". It’s not personal, it’s my job. To be honest, "skating into the puck" can be very draining and difficult . At times I'd rather avoid it and take a "floater" instead. Nonetheless, as another school year begins, I know that for me to be most effective, I must "skate into the puck". Wayne Gretzky, when asked about his unsurpassed ability to see the ice responded with a phrase that has implications as an educator and leader. He said: "I tried to anticipate where the puck would be and move there, instead of chasing to the area where the puck was. Everybody did that." I could totally relate to your article... Very accurate depiction of situations I faced this week. Thanks for sharing. Thanks for the comments Brad & Mary. Brad, thanks for sharing Gretzky's comments - lots of leadership implications for sure!